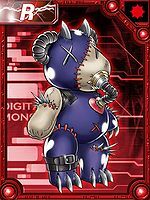 Categorized as one of the Red Data Digimon species, it is a rare Digimon that fears its extinction. 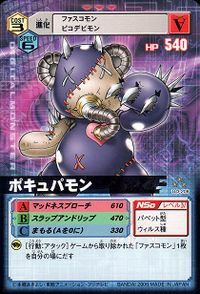 Although it was not originally a species that inhabited the Dark Area, it was driven off by various species of Digimon, and now it lives in the Dark Area. 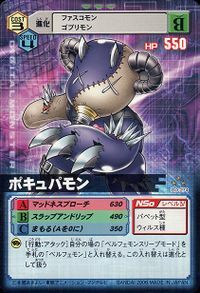 Its body is covered in a special razor material, and although its wickedly-dressed suit is an extreme adaptation, it is thought to be camouflage in order to stay alive in the violent Dark Area. 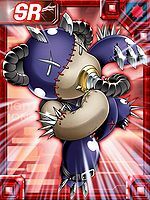 Its Special Moves are stabbing the opponent with its pointed body hair (Madness Broach), and slashing at them with its edged claws (Slap and Rip). 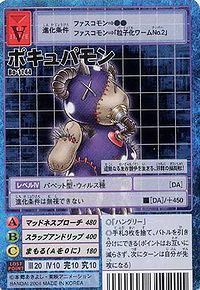 Madness Broach  マッドネスブローチ Maddonesu Burōchi Stabs the opponent with its sharp body hair. 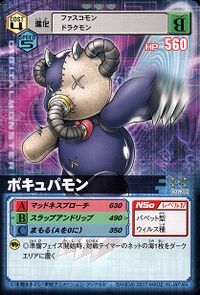 Slap and Rip  スラップアンドリップ Surappu ando Rippu Slashes the opponent with its blade-shaped claws. 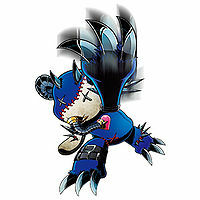 Porcupamon is available as a Digimon Medal. 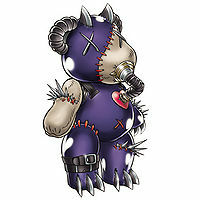 This mimetic beast with wicked thorns lives a harsh struggle for survival! An endangered species of Digimon that did not originally reside in the Dark Area, but was forced there by other Digimon species. The special leather that covers its body is used for camouflage. This page was last modified on 28 December 2018, at 14:38.